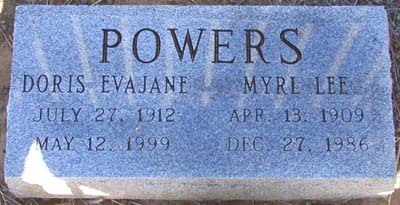 The Powers graves are located on a private ranch on the plains southeast of Colorado Springs. Take Highway 94 east for 12 miles to Peyton Highway. Turn south and proceed for 15 miles to Powers Road. Turn right and drive two miles to the end of Powers Road. The marker is inside a small fence a stone's throw northwest of the northwest corner of the farmhouse, inside the fenced yard. According to GPS-derived geolocation (accurate to within 10 meters), the marker's coordinates are latitude 38°37'16.1"N and longitude 104°29'50.6"W. For permission to enter the property, contact owner Jack Elwell, 2220 Lee Cir. Dr., Woodland Park, CO 80863, (719) 687-9838. The plot includes a marker for and the cremains of Myrl L. and Doris E. Milne Powers, who ranched the Bar N Quarter Circle Ranch. According to her obituary (Colorado Springs Gazette, May 14, 1999), Doris was born July 27, 1912, in Longmont, Colo. She and Myrl married on May 13, 1940, in Colorado Springs. 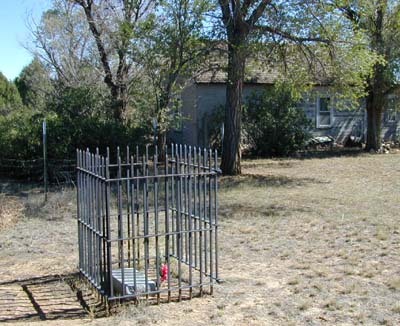 Caretaker of the nearby Chico Basin Cemetery, Doris died May 12, 1999, in Colorado Springs.